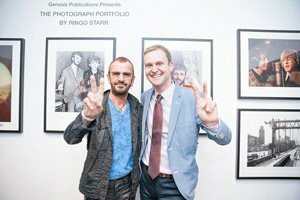 Before Ringo Starr’s appearance at Indigo bookstore tomorrow, Genesis invites you to come and browse his PHOTOGRAPH Portfolio 2015 in person. Nick Roylance and David Hedley will be on hand at Indigo Bay & Bloor from 10am-4pm today and 10am-1pm tomorrow. They’d love to meet you and answer any questions, so do pop in. For more details about the event, and to find out how you can meet Ringo Starr, click here.